on the woodside. 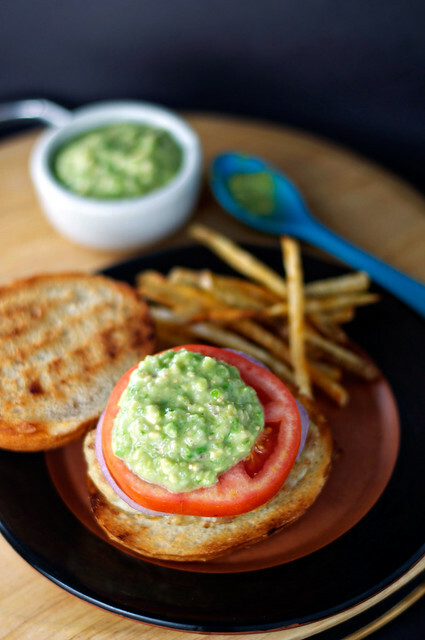 : *chicken burgers with avocado-tomatillo sauce. 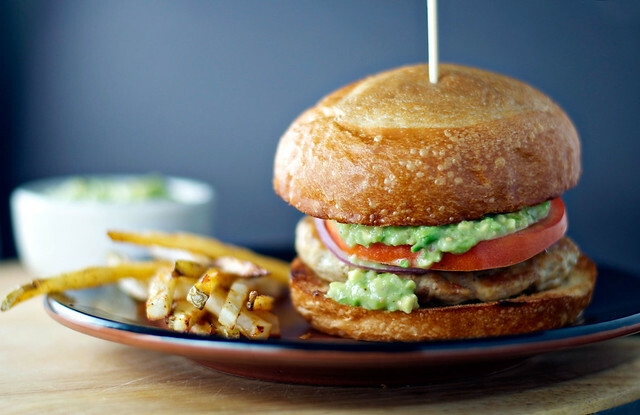 *chicken burgers with avocado-tomatillo sauce. It's a brilliantly cool August Saturday in Alabama (what? ), and I'm sitting on the couch watching Ina make grilled cheese sandwiches. "I've got just a very simple Pullman loaf ... Good bakery loaf—not, like, the stuff from the grocery store." She's the most cheerful snob I know. I have always loved my neighborhood Winn-Dixie grocery store, thank you very much, but I have to admit that when it underwent a floor-to-ceiling overhaul about a year ago, I wasn't terribly thrilled. I didn't want to lose the great Asian food stocks, my treasured self-checkout lanes (no human interaction! my favorite! ), and my beloved solitude (a theme develops). I was quite often, at any time of day, absolutely the only person in there, which may tell you a little something about why the powers that be at the W-D decided the place needed a spruce-up in the first place. Everyone was flocking to Publix, that vast wasteland of crowded produce sections and employees too intensely fascinated with WHAT ARE YOU MAKING WITH THIS?, and that was A-OK by me. More quiet browsing for me around the corner. The Winn-Dixie aisles became my hallowed library halls. But when the store decided it just had to bring itself into this decade, I was nervous. Our relationship was going so well; why did things have to change?? Like any good stubborn person, I found that the results were just (SNIFF!) as I expected. The parking lot began to fill, nobody ever stocked the fish sauce, and why in the world was the bread aisle now frozen-section-adjacent? If there's one thing you should know about me, besides that I can write six or seven paragraphs in praise of supermarkets, it's that I am not a person who should keep bread in the house. If I have bread, and I have cheese, and (god forbid) I have mayonnaise, things can go pretty chubby pretty fast. But the terrific thing about the Winn-Dixie having a bakery is that I can purchase only the amount of bread a normal person should eat in one sitting at a time. This here is a Portuguese roll, and it cost (no lie) 39 cents. It's been a little light on the meat around the Woodside here lately, which is just fine with me—eating vegetarian, even sort of accidentally, is healthy and cheap, and I am just not a person who misses the meat when there are beans and eggs and cheese to be had. But every once in a while I do hear my body say BIG DOSE OF PROTEIN, PLEASE and it's insistent that tofu or quinoa is not the proper vehicle. In this case I used ground chicken, mostly because I wanted that cooked-through texture. I really wanted to bite into something meaty. The tomato is a little bit of an affront to the state of Alabama, but I may have chosen it too hastily. It was certainly not the valedictorian of the 2013 summer semester. The whole shebang, though, is mostly about that chunky avocado-tomatillo sauce. It soaks into the toasty bread (please please toast the bread next to the burger as it finishes) and makes an ordinary weeknight chicken burger something to look forward to. I got off work the night I made this at 7:45 and spent a happy little decompressing half hour or so in the kitchen putting this together—there's no rocket science here, just a lovely sandwich dinner that will help you forget you worked until 7:45. 1. Combine chicken, garlic salt, and black pepper in a medium bowl. Divide mixture into four equal portions, and form into thin patties. 2. Cook chicken patties in a greased grill pan over medium heat 6 to 8 minutes on each side or until completely cooked through. During last minute of cooking, place rolls, cut sides down, on grill pan to toast. 3. Top toasted rolls with tomato slices, onion slices, and Avocado-Tomatillo Sauce. Makes 4 servings. 1. Chop tomatillos, and place in a food processor. Add red onion and next 4 ingredients; pulse until coarsely chopped. 2. Add avocado and salt; pulse until smooth. Makes 1½ cups.